"I downsized the rear wheel to 26 inches"
Is that all there is to successful downsizing, then? Making something smaller? For most people, it’s a bit more than just moving into a smaller home. When nearing retirement, there are usually several major factors involved in planning how you want to spend your new found free time. It should come as no surprise that for most people these are most likely to include spending time with grandchildren, traveling to places on their “bucket list”, taking up new hobbies and just relaxing. How many times have you thought, “Why do we need this big house? We spend all of our time in three rooms.” The extra bedrooms in your home that have gone unoccupied since your children moved out and the formal Living Room that hasn’t been used in years can go unnoticed…until the monthly utility bills arrive. Then you probably ask yourself why you continue to heat and cool unused space. Maybe the staircase to your bedroom is getting too much to manage and that big yard that your kids used to love to run around in now seems like just a big yard; a really, really, big yard that constantly needs mowing, fertilizing, watering, and the dreaded raking of leaves. And cleaning that big house? Don’t even get us started on that one. In addition, no matter how well you have cared for your home over the years there is always going to something that needs to be fixed or replaced. Lightbulb moment—It’s time to downsize your home to upsize your life! Like most important things in life, it’s best to plan ahead. Your retirement is no exception. Your home is one of your biggest investments, so you might want to start thinking about downsizing before you actually retire. In fact, downsizing should be a part of your overall retirement plan. The folks at HGTV offer some great advice. 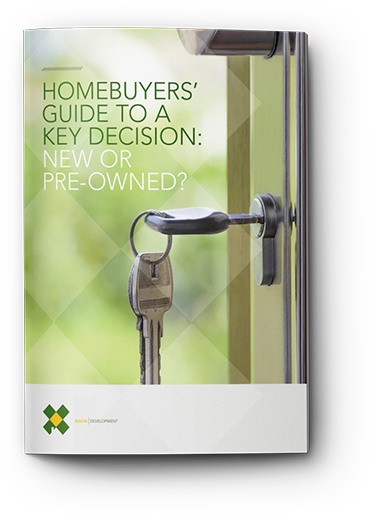 What are some other key factors to consider? Home Maintenance and Utility Costs: It’s not just what it costs you to buy your new home but also what it’s going to cost you every month to run it. Look for homes that are energy efficient and come with Energy Star and National Green Building Standard certifications for a healthier living environment and lower utility bills. Also, bear in mind that if you purchase a newly built home everything is new so it will be virtually maintenance free for years to come. Exterior Maintenance: Sure, tinkering in the garden can be fun and relaxing but what about lawn mowing and snow removal? Not so much. Many new communities offer an Exterior Maintenance Plan which takes care of all of that for you, often for a very reasonable monthly fee. Wouldn’t you rather enjoy your retirement than spend time trying to keep up a beautiful yard? With an Exterior Maintenance Plan you can leave that to others. Design: Like most people looking to downsize, you are most likely looking for a home that will allow you to “age in place.” There are many floorplans geared toward retirees and empty nesters looking to avoid stairs. Ranch plans and First Floor Master Suites are becoming increasingly popular. Newly built homes are designed to take advantage of every bit of space so you can have a smaller home that makes more sense to how you live today. The Best “Bang For the Buck”: Have you ever visited a model home and fallen in love with what you saw, only to be told that it had $100,000. in upgrades not included in the base price? This happens all the time and can be so disappointing! When visiting new home communities, compare standard features. The Builder who gives the most standard features and the most house for the money is usually your best bet. Do your homework and compare apples to apples before making that all-important decision. The folks at HGTV offer some great advice. While downsizing makes perfect sense in every way, the decision to sell the family home where you spent so many happy years can be an emotional one. That’s only natural. It may help to start sifting through your belongings and gradually getting rid of things that you no longer need or use. Your new space will be smaller so look to keep those items which really mean something to you. While it may seem impossible to part with items of sentimental value, most empty nesters eventually come to the realization that it’s useless to feel guilty about getting rid of “stuff,” since no matter what you have accumulated over the years, your children simply don’t want it. Truth be told, they don’t even want their own stuff which you have been asking them to come and get for years. Not sure where to start? Here is some great advice. Decluttering can be a very rewarding experience. Another upside to starting this process early is that your home will be in show ready condition when it goes on the market. Most likely it has been years since you bought a new home. Things have changed a lot since then, even in the last few years. The population has aged and the Baby Boomers are driving the real estate market. This is great news for those looking to downsize since builders have come to realization that one-story ranch style plans and first floor Master Suites are in short supply and have adjusted their offerings to meet the growing demand. No longer encumbered by the structural demands of a second floor, builders are now able to take advantage of the freedom to offer taller ceilings, vaulted ceilings, and larger windows which add to a feeling of spaciousness and grandeur. Everything on one level also means a much larger basement area which allows for a greater amount of storage space when downsizing from a larger home and the possibility of spectacular basement retreats and play rooms for grandchildren. Look for plans that offer unique organizational items like built-in cabinetry flanking the fireplace to store components; benches, hooks, and cabinetry in the mudroom; and built-in desk areas in the kitchen. These items not only help to get your life organized but are clever additions in spots where furniture would usually be required. 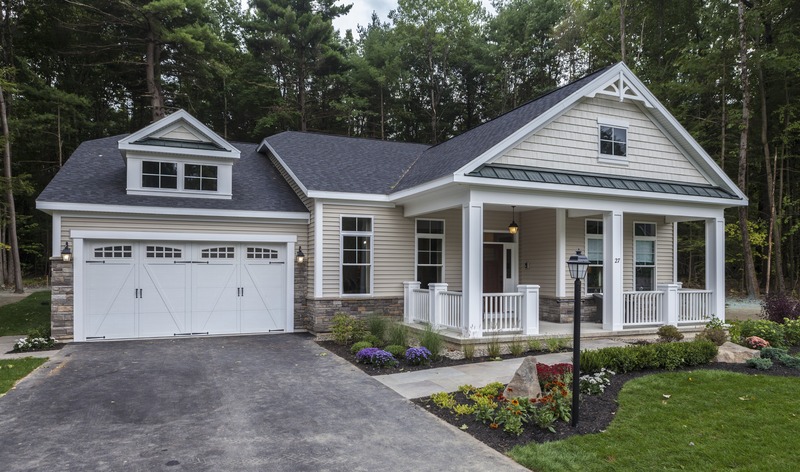 The Homes by Malta Development appeal to those looking for highly functional and dramatic space and recognize that it is more about “right sizing” than “downsizing.” These artfully crafted homes make excellent use of every bit of space without sacrificing architectural style; a fine example of less is more. A full array of modern design elements and amenities like Butler’s Pantry, cleverly designed Pocket Offices, private guest wings, and built-in mudroom cabinetry with bench combine to elevate these homes from practical to dream home. Today’s 50+ is active and highly social. These floor plans are designed with that in mind. Guests wings with private baths are placed on the opposite end of the house from the Master bedroom to allow privacy for all. All newly built Malta Development homes are Energy Star and National Green Building Standard certified, and insulated with super-efficient spray foam insulation resulting in substantially lower utility bills. The “Everything’s Standard” standard features package is the most inclusive in the area. Homes by Malta Development fills a huge need in the Upstate NY area for one-story, ranch style homes and homes with first floor Master Suites, those that allow one to “age in place.” They are designed to be highly functional for years to come, enabling people to stay in their homes longer. Check out our one-story homes HERE and our one-story and first floor master suite townhomes HERE. Explore Homes by Malta Development and see which community is right for you.